James "Jimmy" Winkfield was a Thoroughbred jockey and horse trainer from Kentucky, best remembered as the last African American to ride a winner in the Kentucky Derby. Winkfield was born in Chilesburg, Kentucky and began his career as a jockey in 1898 at age sixteen. He was suspended for four years after just one race for his involvement in a four-horse accident at the starting gate. 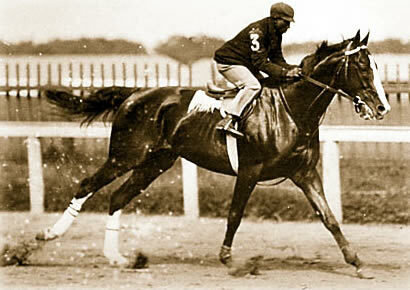 However, he returned in 1900 to ride a horse named Thrive in the Kentucky Derby, finishing third. He rode the race again in 1901 and 1902, winning on His Eminence and Alan-a-Dale respectively - in 1901 alone, he won 220 races. He competed in his final Derby in 1903, finishing second on Early. Later that year, Winkfield emigrated to Russia where he was greeted as a celebrity and in the name of the Czar Nicholas II competed at racetracks all over Europe. He won the Russian Oaks five times, the Russian Derby four times, the Czar's Prize on three occasions, and the Warsaw Derby twice. The Russian Revolution caused him to leave the country in 1917 and he moved to France where he resumed racing, scoring numerous wins including the Prix du Président de la République, Grand Prix de Deauville, and the Prix Eugène Adam. He retired as a jockey at age fifty having won more than 2,500 races then began a second successful career as a horse trainer. Winkfield lived on a farm near the Hippodrome de Maisons-Laffitte (racetrack) in Maisons-Laffitte on the outskirts of Paris. He remained there until fleeing the German occupation of France during World War II. After the war, he eventually returned to the farm at Maisons-Laffitte where he lived until his death 1974. In 1960, Jimmy Winkfield made an appearance at the Kentucky Derby to celebrate 60 years since his historic victories. In 2004 he was inducted posthumously into the National Museum of Racing and Hall of Fame. The Jimmy Winkfield Stakes at Aqueduct Racetrack is run in his honor. In 2005, the United States House of Representatives passed a resolution honoring Jimmy Winkfield. The full details can be read here at the National Museum of Racing and Hall of Fame.